Watch our Producer Awards Night and relive the magic! BRATTLEBORO, VT—In honor of Community Media Day on October 20, Brattleboro Community Television announces its producer awards winners for 2018. BCTV’s annual producer awards ceremony will be held on October 25th at 6:00 p.m. at 118 Elliot, and the public is invited. The People's Choice Award winner, which is a popular vote among the year's top-viewed videos, will also be announced that night. The following organizations and individuals will be recognized. Brattleboro Development Credit Corporation (BDCC) partnered with BCTV this past year to promote awareness of its many activities and programs. BDCC staff worked alongside BCTV to video funding announcements, the Creative Black Tie Gala, the Southern Vermont Economic Development Summit, along with producing PSAs to promote their workshops and other programs. BDCC staff members are also becoming “familiar faces” on Channel 10, as they are frequent presenters at local Select board meetings covered by BCTV. Jennifer Stromsen, BDCC Director of Programs, explains: "Storytelling and video are critical to helping us reach the people, towns, and entrepreneurs we serve across the Windham region. When people see the words "economic development" it may not resonate. But when they see interns working in a local company, young professionals celebrating at the gala, or hundreds of stakeholders at workshops at our annual Summit, they start to understand how the work of BDCC & SeVEDS connects to their lives and goals. BCTV helps us make that connection." River Valleys Unified School District Board was created last summer following the unification of Dover and Wardsboro School Districts under Act 46. The River Valleys USD Board turned to BCTV to video their bi-weekly meetings as a way to engage and provide transparency. And, in fact, thanks to the Board’s promotional efforts, most of the meetings have received hundreds of views. Board Chair Richard Werner notes: "It's gratifying to get so many views, and critical that those who can't attend can get the full flavor of the somewhat complex process. In addition, it’s been a benefit to all of us to be able to review the videos as work progresses." Brattleboro Rotary Club past chair Marty Cohn, who’s also a producer at BCTV, created the show "Rotary Cares," producing 10 episodes since October 2017. Each monthly episode features two members from Brattleboro Sunrise Rotary or Brattleboro Rotary Club to talk about Rotary International and discuss local projects. Cohn says, “Not only do we reach the viewers in Brattleboro, but we also reach a world wide audience by posting the link on our website and social media pages." The video director for the series is Rotary Club member Kevin Yager. Russ Grabiec is a familiar face to anyone who attends Brattleboro Selectboard Meetings. He’s the one who cheerfully operates the camera all meeting long, no matter how long it goes. Grabiec is also one of BCTV's most prolific producers, recording and editing 25 shows this year about Veteran's Events, the Brown Bag Lunch presentations at the River Garden, and Dover Free Library Lectures, to name a few. When the call goes out for a volunteer producer, he is often the one who steps up. Finally, Grabiec deserves special recognition for learning a new editing platform this year, Adobe Premiere, after resisting for as long as possible. He invites others to join him: "Our cameras record moments in history. Come to BCTV. Record your moment. Learn to edit (we have people...). It's rewardingly addictive!" Alfred New is the engine behind the success of BCTV's longest-running weekly show, St. Michael's Catholic Mass. The Mass is recorded by a team of volunteers, and is available for parishioners to watch that same Sunday, either on cable or online. Over 9 years and almost 450 episodes later, New has updated the video equipment at the church and kept up with technological changes, including uploading the service to YouTube. This year, New started a new show, "5 Mics Songwriters Series," which showcases live music in Brattleboro. As a BCTV volunteer, he runs a camera for The World Fusion Show and covers events when requested. As he says, "St. Michael’s Catholic Church of Brattleboro is a warm, welcoming and vibrant community. Our original goal was to record the Mass for those who couldn’t attend. We’ve found that many who did attend, also watch; and that people all over the country also watch. Being able to share our wonderful church with others is very rewarding." For the Songwriter Series, he notes that "Brattleboro has a great number of talented musicians and I wanted to find a way to support them and the venues where they play. BCTV has given me a way to do this." 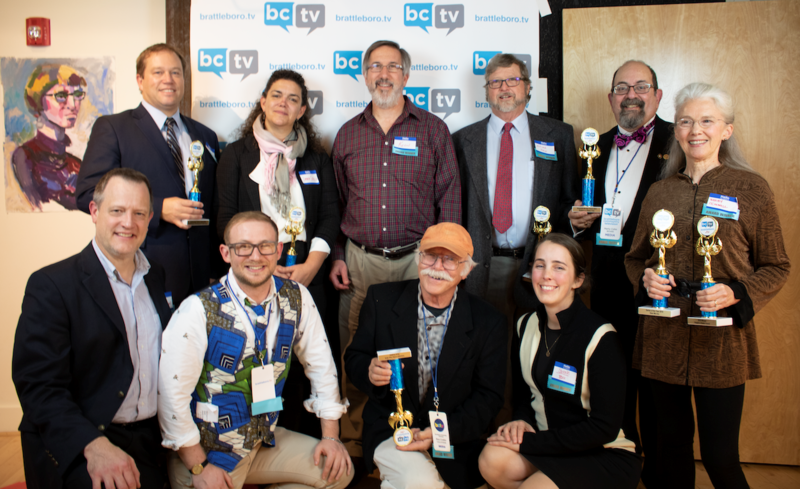 BCTV's 50+ local producers were nationally recognized in 2018 and together with staff produced more than 1200 hours of local programming over the past year. The BCTV awards ceremony is fashioned after the Emmys, and dress up is suggested to honor the talent and dedication of local producers. Audience members will enjoy dinner by Hazel, a cash bar, and the chance to mingle with creative types and community volunteers. A $5 donation is suggested. Brattleboro Community Television is a community media center serving Brattleboro, Dummerston, Guilford, Jamaica, Newfane, Putney, Townshend and Vernon. BCTV's mission is to promote civic engagement and transparency, and to empower community members to share their knowledge, views and creativity, without prejudice. To learn more about BCTV, visit brattleborotv.org or call 802-257-0888.